Have you ever driven through your town and realized that there weren’t nearly enough rainbows? 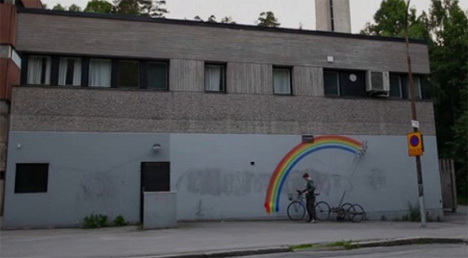 This guy is doing his part to brighten up the world with his “robo-rainbow” assembly: a robotic arm outfitted with swiveling spray paint cans that spray picture-perfect rainbows onto any surface accessible by bike. The creator of this unspeakably cool graffiti machine spreads color everywhere he goes – yes, it’s graffiti and it’s illegal, but at least it’s much more positive than most of the tags you’ll see while out and about in any city. The actual machine used to spread rainbow joy is a pretty simple custom bike trailer with a moving arm. The video doesn’t go into detail about how the gadget was built, but if you’re into this sort of thing (and don’t mind the fact that it’s not exactly the most legal thing you can do with a bike and some circuitry) it shouldn’t be too hard to figure out. And in no time, you’ll be spreading multi-colored joy all over your drab grey town. See more in Do It Yourself or under Technology. February, 2011.